Crème formula helps to blends away grey hair for a natural-looking colour. Leaves your hair full of visible shimmering tones. Includes nourishing conditioner with coconut oil. No ammonia formula for a pleasant smell. Colour lasts up to 28 shampoos. 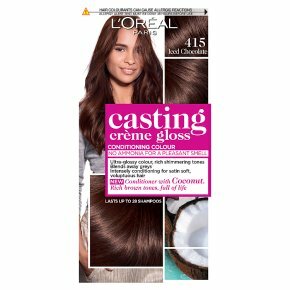 For brown hair. Achieve natural-looking colour with visible shimmering tones using Casting Crème Gloss. The no-ammonia crème formula blends away grey hair, and provides a luscious smell. Colour lasts up to 28 shampoos. After colouring, the conditioner is enriched with Coconut oil that reveals the richness of your brown hair. It leaves your hair soft and voluptuous with an exceptional shine.